By traveling to Israel with Birthright Israel & Shorashim, you are taking advantage of an awesome opportunity to see Israel from the inside - through the eyes & hearts of Israelis. Since 1983, Shorashim has brought thousands of Americans to Israel on incredible, safe, & fun journeys. The opportunity to travel on Birthright Israel with Shorashim is a gift of a lifetime & we are committed to the ensuring the well-being of each of our participants. Your health, safety, & security are our top priority & we have developed a program that prioritizes a safe, secure, meaningful, & fun journey through Israel. The government of Israel is a full partner with the Birthright Israel program & has dedicated its vast resources to helping ensure the safety of our programs. We monitor the situation in Israel & the Middle East daily & consult with the experts on an ongoing basis. Security guidelines established for this trip are extensive, & are detailed in the Security Policy & Procedures & Travel Safety Tips. If you have any questions, please do not hesitate to contact us at (312) 267-0677 or at registration@shorashim.org. We operate under extensive safety precautions. We have developed a program that is as safe, secure, meaningful & fun as possible. The government of Israel is devoted to the safety & security of visitors and citizens alike. Birthright Israel and Shorashim are in constant contact with the appropriate Israeli security/public safety authorities. Our program is approved daily with the "situation room" administered by the Israeli Ministry of Education, Military, & Police. They issue specific guidelines as to where it is safe to travel & the best routes to use. Changes in itinerary are made immediately if necessary (weather or security related). Professional security escorts & a medic accompany the group at all times. Birthright Israel has signed special contracts with the airlines carrying participants as part of this program to ensure a heightened level of security. Airline security for international travel is stricter than for domestic flights, & has been heightened after September 11. Israeli airline security is widely considered the best in the world. Public transportation is not allowed. Groups travel with cellular phones & can be reached 24 hours a day. A chartered bus with one bus driver remains with the group for the entire trip. Our drivers never leave their buses unattended or unlocked. All participants have a security orientation upon arrival in Israel, which includes extensive travel safety tips & free time guidelines. Participants will have time to shop & relax, but free time will only be permitted at structured, supervised times and locations. A 24-hour emergency number in Israel to use in the event of a family emergency or crisis at home will be sent to participants along with trip itineraries. Parents, friends, & relatives can always contact our U.S. or Israel office for any matter. Both of our offices will be in regular contact with trip staff in Israel. Shorashim offers limited secondary medical insurance from an Israeli HMO while on the ground in Israel, but participants must have or purchase existing medical coverage that provides for coverage in Israel. The insurance provided by Shorashim does not cover pre-existing conditions, follow-up treatment, psychiatric conditions or illness cause by drug or alcohol use or abuse. Participants should contact their local insurance carrier to understand their coverage overseas & to confirm reimbursement policies. Participants should consult with their physician regarding any existing medical conditions. Necessary medication should be brought for the entire trip, along with a copy of the prescription. Participants must indicate all medication currently prescribed, ongoing treatments, & any medical issues that are relevant to a program of this nature on the medical form. The following treatments are available in the event of illness or injury. Basic first aid is administered by medics accompanying the group. Doctors are available to those who need additional care. These doctors can prescribe additional medication as appropriate. They will also refer participants to specialists, when necessary. Should urgent medical care be required, participants will immediately be taken to an authorized clinic or to an emergency room. A staff member will accompany participants on any visits to doctors, clinics or hospitals. We ask our participants to abide by common sense travel tips, so that their trip to Israel can be both safe & memorable. 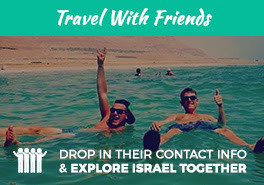 Birthright Israel's free time guidelines are designed to ensure the safety of trip participants at all times during the program. Use your common sense. If something isn't appropriate at home, it probably isn't in Israel either. Make a copy of your passport & keep it with you. Store your passport & important travel information in a safe place, like a safe in your hotel. Wear casual clothes & don't wear a lot of jewelry. Keep cameras inside a secure bag. Travel light as the groups move around a lot & you will be less likely to lose or forget something. Do not leave any packages or bags unattended. In Israel, if a 'suspicious' package is found, the police are called immediately & the package is often destroyed. Be attentive on the streets & particularly aware in crowded areas such as local festivals, markets, & crowded tourist sites. Avoid public demonstrations or commotion. Relax & look like you belong wherever you are. Don't appear lost or vulnerable. Use common sense. Don't discuss travel plans with strangers. Lock your hotel room door at night. Non-participants are not allowed in your room. Free time will only be permitted at structured, supervised times, locations. Once the group returns to the hotel at night, you are not permitted to go out again on your own. Additional 'free time' activities have been scheduled in the hotel in the evening, & you may make full use of the hotel facilities until closing. When on free time, adhere to the directions given by trip staff. If you have friends or relatives in Israel, please invite them to visit you at the hotel during free time. Anyone who leaves the group without prior approval will immediately be removed from the program & forfeit his/her deposit. In the event of emergency, proceed immediately to where you were supposed to meet your group or bus. In the evenings, meet in the hotel lobby. If you are unable to return to your group, please contact the staff. Check your emergency card, which will be distributed at the beginning of the trip, for the appropriate numbers to call.